After having this lentil dish at a local restaurant, Khyber Pass, we loved it so much that we wanted to make it at home. With just a minor tweak we found the recipe we were looking for on this website. It is not your stodgy brown lentils but small red lentils which turn yellow when you cook them. I have included the recipe below the picture. Since this is a vegetarian recipe I am the cook tonight. Along with the lentils I also make a really tasty tabbouleh. Depending on whether you are vegan, vegetarian, or omnivore you can tweak this recipe to fit your food lifestyle. Heat the olive oil over medium-low heat in a medium sauce pan. Add the onion, garlic and ginger and saute for about 5 minutes until the onion is translucent. Add the turmeric, cumin, cayenne, lentils and broth, stir and turn the heat up to high. When the liquid boils, turn the heat down to a simmer, cover and cook until the lentils are very tender, about 15 minutes. Remove from heat and add the lemon juice and salt. Serve with a spoonful of plain yogurt (or not) and warm pita or nan bread. 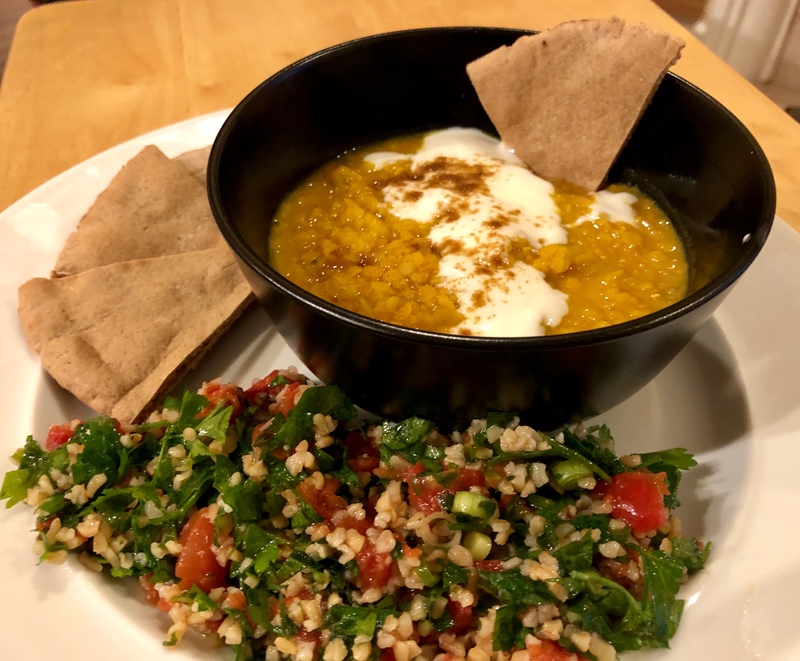 This entry was posted in Easy, Legumes, Recipes, Vegan, Vegetables, Vegetarian and tagged lentils, tabbouleh. Bookmark the permalink.